The very best thing you can do to repair a tooth that has a cavity – or has been cracked or chipped from an old filling – is to treat it with cast gold. Typically called onlays or inlays, gold restorations perform better and last longer than any other dental substance. In the olden days, dentists worldwide primarily repaired cavities by drilling out the tooth decay and filling the indentation with an amalgam* substance (liquid mercury combined with a powdered alloy of silver, tin and copper). This filling, over time, would invariably shrink and separate from the healthy enamel. The tooth would inevitably crack, fracture and/or chip as a result. Precision: The gold repair is cast in a laboratory, creating a more precise fit in the effected tooth as well as the opposing and surrounding teeth. Durability: Gold inlays/onlays/overlays last much, much longer than amalgam or porcelain, typically 20-30 years or longer. Consistency: Gold does not chip or fracture like amalgam and porcelain. Strength: Gold restorations actually strengthen the tooth and prevent it from fracturing. Protection: Gold decreases the possibility of future decay because it repels bacteria. Flexibility: Gold expands and contracts with the tooth when exposed to hot and cold temperatures (i.e. ice cream and coffee). Pliability: Gold is soft and pliable, perfect for rebuilding and finely shaping the repair to the original structure of the tooth. Improves Over Time: The more your chew, the tighter the gold adheres to the tooth, which prevents decay from forming in the thin border between the filling and the tooth. Best Value: Though gold restorations cost more upfront than their porcelain or amalgam counterparts, they are a far better solution that will last years, often decades, longer. 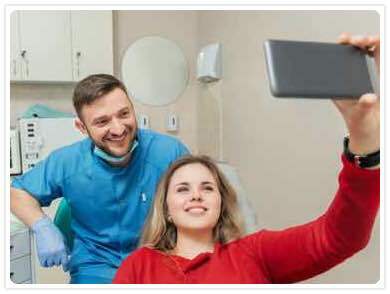 Time: Because they are cast and then bonded to your tooth, rather than packed in from a malleable substance, gold restorations take longer to implement than traditional fillings (two visits instead of one). Expertise: Gold restorations require great finesse and precision to install. Make sure your dentist has the expertise and experience you deserve. Inlays, onlays and overlays that are cast from gold make the finest possible tooth repairs and restorations. 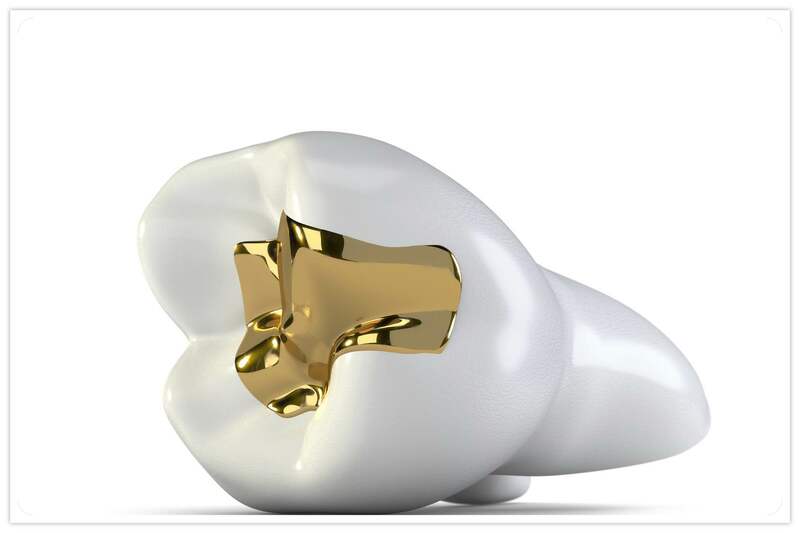 The benefits of using gold in the restoration and repair of your teeth are vast and significant. Gold is simply the very best substance dentists can use to restore decayed, fractured or chipped teeth. Cast gold restorations perform better and last many years longer than amalgam, composite and porcelain. Gold even helps protect your teeth from future decay. And that’s an investment worth smiling about. *Dental amalgam, according to the U.S. Food & Drug Administration is a mixture of metals, consisting of liquid mercury and a powdered alloy composed of silver, tin, and copper. Approximately 50% of dental amalgam is elemental mercury by weight. "The best thing you can ever wear ... is a smile!" So You Have a Toothache. What Next?